Pack 28 plates, 1 teapot, 4 bowls, 4 cups and saucers, or 20 plates, 1 teapot. 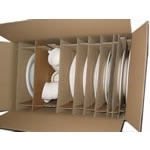 8 bowls, 8 cups and saucers, condiment set, or any combination you like, the choice is yours!, the only limit to packing in this box is your imagination!. The internal fittings can come out to increase the inside compartments to fit larger items such as teapots. The box comes complete with 5 foam bags to assist in packing. You can add the tissue paper to go with this item click here.